Which ST:TNG episode contains image of surprised Picard face? And exactly in what scene it appears? 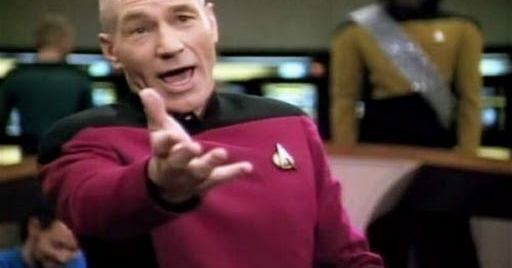 What Picard is saying at the very moment, that is pictured? "My love is a fever, longing still For that which longer nurseth the disease." "In faith, I do not love thee with mine eyes, For they in thee a thousand errors note; But 'tis my heart that loves what they despise; Who in despite of view is pleas'd to dote." The image taken comes from this moment. What is the meaning of “Tapestry” title for ST:TNG 6x15 episode? Which Star Trek:TNG episode does Data asks Picard whether a human has a moral obligation to use augmented prosthetic? Which is the TNG episode where “time warp” is considered as a means of travel? What TNG episode is this clip of Jean-Luc Picard wearing a suit from?